The U.S. Department of the Interior is looking for a new logo and has submitted its request to an online forum in where anyone can sign up to submit their ideas and compete for the $1000 award should their logo design be selected by the agency. 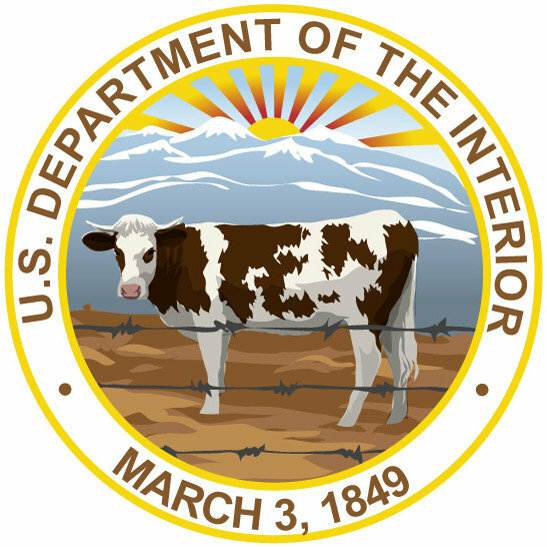 The U.S. Department of the Interior would like a logo for use on clothing (hats, t-shirts, jackets). Our official seal (which we are keeping – see update 4 below) has many colors (10) and is highly detailed – excellent for a seal, less so for a logo. We’re looking for a logo that is both elegant (simple) and meaningful. DOI is a cabinet-level agency with responsibility for land management, energy production, conservation, and more. The design must appeal to both our internal and external audiences. More specifically, the logo must appeal to the 70,000 employees of Interior, as well as (in alphabetical order) cattlemen/ranchers, coal miners, conservationists, farmers, fishermen, historians, hunters, Native Americans & tribal entities, offshore oil and gas producers, recreation enthusiasts (boaters, hikers, campers) and others. We recognize that this is a lengthy list and include it for a sense of the breadth and scale of our missions. Mission: The U.S. Department of the Interior protects America’s natural resources and heritage, honors our cultures and tribal communities, and supplies the energy to power our future. It’s too bad Interior didn’t open up its selection process to a online public vote ! If anyone else has creative ambition and would like to submit their logo idea(s) the deadline for submissions is June 15. I am not one for drawing but it needs a toilet to match Salazar’s function as chief. Well, you could have the steer (bull, heifer whatever) facing to the right. That would be reminiscent of Secretary James Watt’s effort to change Interior’s left facing bison by turning it to the right. True story, for those who do not remember or were too young to know this. Who said Watt was a dim bulb? For one thousand dollars and the effort it would take to create a new logo I will pass. I have other things to do. I was thinking along the lines of a bulldozer and an oil rig. Maybe sneaking the word “Macondo” into it would also be a nice touch. My offering would be from my old beloved Earth First tee shirt from the Watts era, with an image of a Bull Elk standing in about a 10’x10′ corral. Had an identity of James Watt National Park, or something to that effect. Kept it on most of the time I was in Jackson, hoping to run into Watt. Wore it out and seen him on Cache street shortly after that. Damn! Why don’t they just use the McDonalds Golden Arches. I’ve seen a satirical logo of a bison skull in the middle of a bare dirt pasture backed by a helicopter and an oil rig spewing oil. All negative items that will surely never make it on the real logo (“its not a seal!”). DOI should probably do what most government agencies are doing now – hire an overpriced PR firm to come up with the “ultimate” branding to appease everyone. Oh, sorry, branding is also a word that they would also like to shy away from.